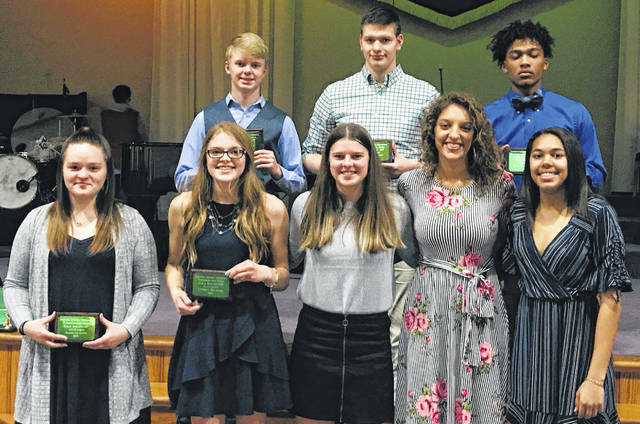 Washington Blue Lion student-athletes were among those recognized at the Frontier Athletic Conference’s winter sports banquet Thursday, March 14, 2019. They are First Team, All-FAC for the 2018-19 winter sports season. (front, l-r); Maitlyn Cave, Lindsey Buckner, bowling; Shawna Conger, Hannah Haithcock, Rayana Burns, basketball; (back, l-r); Owen Mullins, Austin Knisley, bowling and Evan Upthegrove, basketball. Not pictured: Branton Dawes, wrestling.